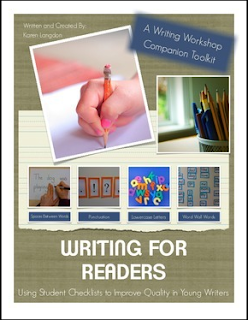 This is a complete package of paper designed to accompany a writing for readers (conventions) writing unit for young writers. Each paper has a checklist included right on it that students can use as a rubric to self monitor their writing. Included you will find checklist paper with lines, without lines, a booklet cover, booklet paper, a large group checklist, and a peer checklist. This unit teaches students to use punctuation, spaces between words, lowercase letters (except in specific situations), and word wall words spelled correctly. There is also a guide to using checklists in the classroom, and a pacing guide for the unit.